The Mtroniks brushed motor speed controllers are ideal for use in boats, cars or locomotives. Don't be put off by the 'Marine' or 'Loco' naming; all of them can be used to control all types of brushed motor. The important aspects are the maximum voltage and current rating. All Mtroniks ESC are waterproof. 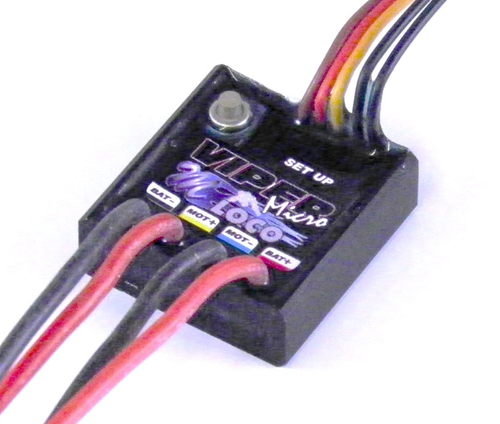 The MicroViper 10 is a miniature fwd/rev brushed speed controller designed specifically for use in small models. It has a small footprint and is fully waterproof for use in model boats. Viper speed controllers are designed for use with NiCd, NiMH or Lead Acid batteries, they do not have a low voltage cutoff. The ESC has protection from motor shorts and over-temperature. Download the Micro Viper 10 user manual. 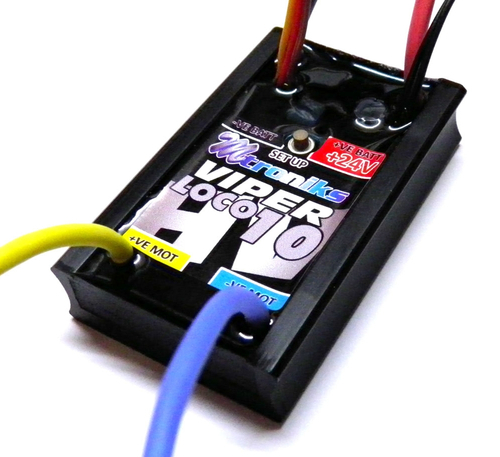 The MicroViper Loco is a miniature 10A fwd/rev brushed speed controller designed specifically for model rail. It has a small footprint and features motor short protection, motor stall protection, adjustable reverse including reverse disable, built in cruise control, which holds the speed steady when signal is lost. Viper speed controllers are designed for use with NiCd, NiMH or Lead Acid batteries, they do not have a low voltage cutoff. Download the Viper MicroLoco user manual. The Viper Marine20 is a fwd/rev brushed speed controller designed specifically for use in R/C model boats. It is very easy to setup and is fully waterproof. Download the Viper Marine user manual. The Micro Loco 10 HV is designed for use in R/C locos with battery voltage of 12V to 24V. Features include cruise control, 2A BEC, motor stall protection and selectable fwd/rev or fwd only. The Viper HV controllers are designed for use with NiCd, NiMH, Lead Acid or Lithium Polymer batteries. The ESC detects the number of LiPo cells at start-up and implements a motor cut-off at 3V per cell. The ESC has protection from motor shorts and over-temperature. Download the Viper Loco 10HV user manual.